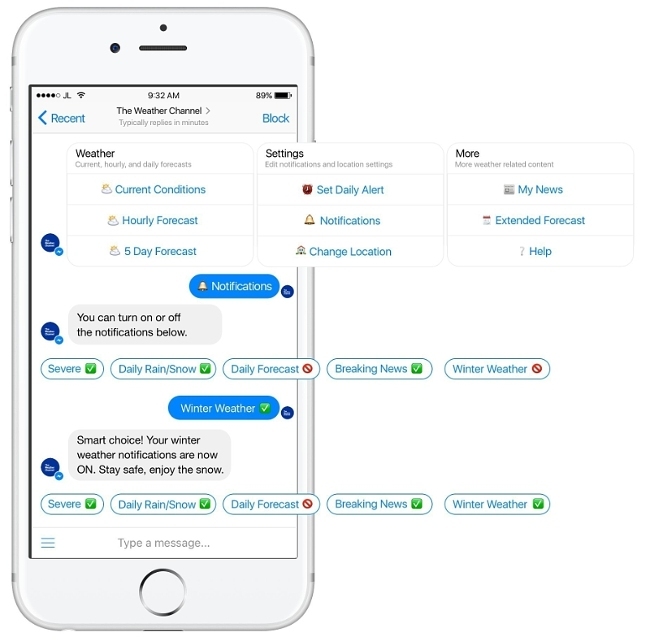 The Weather Company, an IBM Business (NYSE: IBM) announced today that The Weather Channel has launched a cognitive weather bot for Facebook Messenger – powered by IBM Watson. Around the world, Messenger is used to stay in touch with friends and family. Now with The Weather Channel bot, it offers a way to view and share personalized weather-related news content, current conditions, forecasts, severe weather notifications, and other relevant weather information. Every day, millions of individuals and businesses across the globe rely on the hyperlocal weather data within The Weather Channel’s mobile apps and website, weather.com, whether it’s to plan their day, help them prepare for severe weather or make better business decisions. With the launch of the new bot for Messenger, The Weather Channel brings an entirely new customizable weather experience to users. Leveraging IBM Watson Natural Language Classifier and Alchemy Language APIs, over time the bot will learn a user’s preferences to deliver weather-related content specific to their individual interests. Using the natural language and machine learning capabilities of IBM Watson – as a person continuously engages with the bot – it will make recommendations, predict, and have conversations to provide a more personalized experience. Available in 39 languages, Facebook and Messenger users can easily access the bot through The Weather Channel Facebook fan page, as well as the Messenger app. Weather Means Business™. The world’s biggest brands in aviation, energy, insurance, media, and government rely on The Weather Company for data, technology platforms and services to help improve decision-making and respond to weather’s impact on business. For more, visit theweathercompany.com.